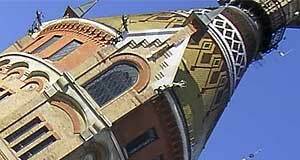 The Wasserturm Favoriten is a well-known landmark in the 10th district of Vienna, Favoriten. The Wasserturm (Water Tower) was built in the 19th century and is considered an important building of the "Industrial Historicism", overshadowed in Vienna only by the enormous Gasometer City in Simmering. The Wasserturm is located on the hilltop of the Wienerberg, no far from the Spinnerin am Kreuz, a Gothic shrine. The architect Franz Borkowitz designed the Wasserturm, which was built between 1898 and 1899. By this time, the Erste Wiener Hochquellleitung from 1873 (the first water pipeline that provided Alpine spring water from the Rax/Schneeberg area for Vienna - for details, please read my article on the Hochstrahlbrunnen) did not have enough pressure to supply settlements on Vienna′s few hills in Meidling and Favoriten. There was another water tank on the Rosenhügel hill, but the rapidly increasing population of Vienna generated an urgent need for an alternative water supply. The Wasserturm Favoriten bridged a gap of ten years, from its opening in 1899 to approximately 1910, when the Zweite Wiener Hochquellleitung (a second water pipeline from even higher altitudes in the Alps) was opened. After that, the Wasserturm was used only for peak situations and emergencies. When it was opened, the Wasserturm was equipped with a steam engine to pump the water from lower altitudes into its tank - 70 litres per second. In 1956, the Wasserturm Favoriten was officially closed and started to fall into disrepair. Between 1988 and 1990, the city of Vienna renovated and adapted the Wasserturm: Since then, it serves as a look-out tower, a museum and a culture venue /exhibition space. The rather pretty brick-building is a nice feature at the heart of a not-so-nice district. A few facts and figures on the Wasserturm Favoriten: It is 67 metres high, 17 metres wide and comprises of two cylindrical pillars, one in another, with the outer - decorative one - being made of brick. The inner cylindrical pillar is not as high as the outer one and contained the main water reservoir. At the bottom of the tower, it is 1.5 metres thick and becomes thinner towards the top - down to a tad more than one metre. The Wasserturm could hold more than 1,000 cubic metres of water in an eight metre high tank. A second tank held more than 200 additional cubic metres. The ramp that takes visitors to the top of the Wasserturm is 203 metres long. Today, the Wasserturm Favoriten can be visited as a look-out: There is a viewing platform at approximately 50 metres from where you can see the Rax and Schneeberg mountains - from where Vienna′s tap water still originates today. In the other direction, you can enjoy a particularly nice vista on the central parts of Vienna. In terms of sightseeing from look-outs, please read my article on "Vienna from Above". Attractions nearby are limited - Favoriten is a cheap residential area with a commercial touch, but neither historically nor otherwise interesting - apart from the Wienerberg with the Spinnerin am Kreuz, as mentioned above. Wasserturm Favoriten - "Official Website"